Hoover, Alexander P. Griffith, Boyce E. and Miller, Laura A. 2017. Quantifying performance in the medusan mechanospace with an actively swimming three-dimensional jellyfish model. Journal of Fluid Mechanics, Vol. 813, Issue. , p. 1112. Pan, Xiaomin Lee, Changhoon Kim, Kyoungyoun and Choi, Jung-Il 2016. Analysis of velocity-components decoupled projection method for the incompressible Navier–Stokes equations. Computers & Mathematics with Applications, Vol. 71, Issue. 8, p. 1722. The hydrodynamics of a swimming jellyfish depends on the morphology of the species. For example, oblate jellyfish appear to generate wide vortex structures near the bell margin. The vortex structures affect both the propulsion system and the feeding structure because the swimming and prey capturing activities are interrelated processes in these taxa. 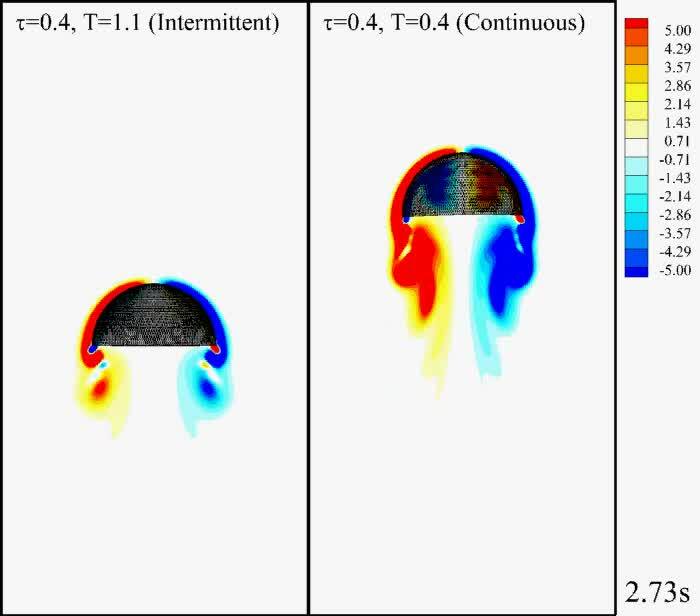 A three-dimensional computational model was established for an oblate jellyfish to analyse how the vortex structures present in the wake affect the swimming mechanism and the propulsion efficiency, which is defined as the ratio of power output (thrust multiplied by centre velocity) to power input (energy rate required for bell contraction). An improved penalty immersed boundary method was adopted to consider the interactions between the swimming jellyfish and the ambient fluid. The vortex structures in the wake of the swimming jellyfish were investigated in detail. The vortices generated by the contraction and expansion of the jellyfish bell interact with the vortex structures generated by the forward-moving behaviour of the jellyfish. The resulting vortex structures not only transfer momentum to the swimming jellyfish via the fluid, thereby providing the main source of thrust, but also have an implication for feeding. The effects of the elastic properties of the jellyfish on the propulsion were examined. The propulsion efficiency reaches its optimum value at particular elastic properties. We also investigated the effect of the swimming pattern of jellyfish on the propulsion efficiency. The efficiency increases with the flapping frequency and force duration. Alben, S., Miller, L. A. & Peng, J. 2013 Efficient kinematics for jet-propelled swimming. J. Fluid Mech. 733, 100–133. Barthes-Biesel, D., Diaz, A. & Dhenin, E. 2002 Effect of constitutive laws for two-dimensional membranes on flow-induced capsule deformation. J. Fluid Mech. 460, 211–222. Cirak, F., Ortiz, M. & Schroder, P. 2000 Subdivision surfaces: a new paradigm for thin-shell finite-element analysis. Intl J. Numer. Meth. Engng 47, 2039–2072. Colin, S. P. & Costello, J. H. 2002 Morphology, swimming performance and propulsive mode of six co-occurring hydromedusae. J. Expl Biol. 205, 427–437. Colin, S. P., Costello, J. H. & Klos, E. 2003 In situ swimming and feeding behavior of eight co-occurring hydromedusae. Mar. Ecol. Prog. Ser. 253, 305–309. Costello, J. H. 1992 Foraging energetics in hydromedusae. Sci. Mar. 56, 185–191. Costello, J. H. & Colin, S. P. 1994 Morphology, fluid motion and predation by the scyphomedusa Aurelia aurita . Mar. Biol. 121, 327–334. Costello, J. H. & Colin, S. P. 1995 Flow and feeding by swimming scyphomedusae. Mar. Biol. 124, 399–406. Costello, J. H., Colin, S. P. & Dabiri, J. O. 2008 Medusan morphospace: phylogenetic contrants, biomechanical solutions, and ecological consequences. Invertebr. Biol. 127, 265–290. Dabiri, J. O., Colin, S. P., Katijia, K. & Costello, J. H. 2009 A wake-based correlate of swimming performance and foraging behavior in seven co-occurring jellyfish species. J. Expl Biol. 213, 1217–1225. Dabiri, J. O. & Gharib, M. 2003 Sensitivity analysis of kinematic approximations in dynamic medusa swimming models. J. Expl Biol. 206, 3675–3680. Daniel, T. 1983 Mechanics and energetics of medusan jet propulsion. Can. J. Zool. 61, 1406–1420. Daniel, T. 1985 Cost of locomotion: unsteady medusan swimming. J. Expl Biol. 119, 149–164. Demont, M. E. & Gosline, J. M. 1988a Mechanics of jet propulsion in the hydromedusan jellyfish, Polyorchis penicillatus: I, mechanical properties of the locomotor structure. J. Expl Biol. 134, 313–332. Demont, M. E. & Gosline, J. M. 1988b Mechanics of jet propulsion in the hydromedusan jellyfish, Polyorchis penicillatus: II, energetics of the jet cycle. J. Expl Biol. 134, 333–345. Demont, M. E. & Gosline, J. M. 1988c Mechanics of jet propulsion in the hydromedusan jellyfish, Polyorchis penicillatus: III, a natural resonating bell; the presence and importance of a resonant phenomenon in the locomotor structure. J. Expl Biol. 134, 347–361. Dular, M., Bajcar, T. & Sirok, B. 2009 Numerical investigation of flow in the vicinity of a swimming jellyfish. Engng Appl. Comput. Fluid Mech. 3, 258–270. Ford, M. D. & Costello, J. H. 2000 Kinematic comparison of bell contraction by four species of hydromedusae. Sci. Mar. 64, 47–53. Ford, M. D., Costello, J. H., Heidelberg, K. B. & Purcell, J. E. 1997 Swimming and feeding by the scyphomedusa Chrysaora quinquecirrha . Mar. Biol. 129, 355–362. Fung, Y. C. & Tong, P. 2001 Classical and Computational Solid Mechanics. World Scientific. Herschlag, G. & Miller, L. 2011 Reynolds number limits for jet propulsion: a numerical study of simplified jellyfish. J. Theor. Biol. 285, 84–95. Huang, W.-X., Chang, C. B. & Sung, H. J. 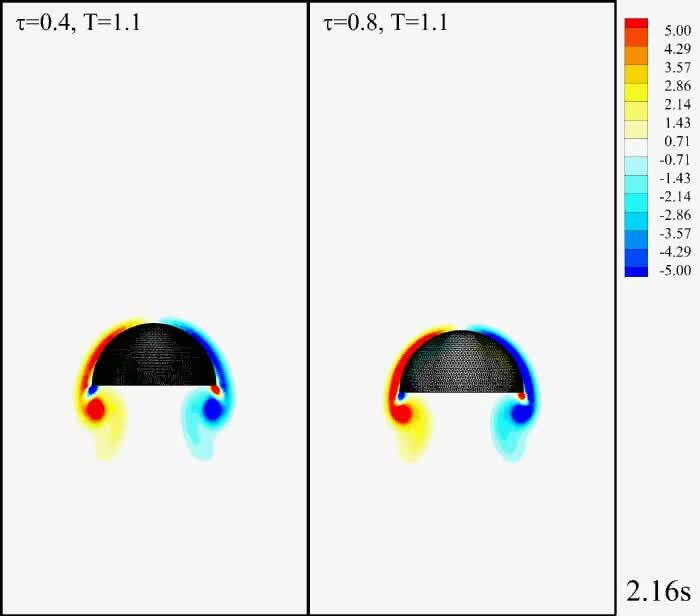 2011 An improved penalty immersed boundary method for fluid-flexible body interaction. J. Comput. Phys. 230, 5061–5079. Huang, W.-X., Chang, C. B. & Sung, H. J. 2012 Three-dimensional simulation of elastic capsules in shear flow by the penalty immersed boundary method. J. Comput. Phys. 231, 3340–3364. Johnson, T. A. & Patel, V. C. 1998 Flow past a sphere up to a Reynolds number of 300. J. Fluid Mech. 378, 19–70. Lai, M.-C. & Peskin, C. S. 2000 An immersed boundary method with formal second-order accuracy and reduced numerical viscosity. J. Comput. Phys. 160, 705–719. Lima, S. L. 1985 Maximizing feeding efficiency and minimizing time exposed to predators: a trade-off in the black-capped chickadee. Oecologia 66, 60–67. Liu, H., Wassersug, R. J. & Kawachi, K. 1996 A computational fluid dynamics study of tadpole swimming. J. Expl Biol. 199, 1245–1260. Mchenry, M. J., Pell, A. C. & Long, J. H. 1995 Mechanical control of swimming speed: stiffness and axial wave form in undulating fish models. J. Expl Biol. 198, 2293–2305. Megill, W. M., Gosline, J. M. & Blake, R. W. 2005 The modulus of elasticity of fibrillin-containing elastic fibres in the mesoglea of the hydormedusa Polyorchis penicillatus . J. Expl Biol. 208, 3819–3834. Mills, C. E. 1981 Diversity of swimming behaviors in hydromedusae as related to feeding and utilization of space. Mar. Biol. 64, 185–189. Patankar, S. V. 1980 Numerical Heat Transfer and Fluid Flow. McGraw-Hill. Rudolf, D. & Mould, D. 2010 An interactive fluid model of jellyfish for animation. Commun. Comput. Inform. Sci. 68, 59–72. Santhanakrishnan, A., Dollinger, M., Hamlet, C. L., Colin, S. P. & Miller, L. A. 2012 Flow structure and transport characteristics of feeding and exchange currents generated by upside-down Cassiopea jellyfish. J. Expl Biol. 215, 2369–2381. Summers, A. P., Darouian, K. F., Richmond, A. M. & Brainerd, E. L. 1998 Kinematics of aquatic and terrestrial prey capture in Terrapene carolina, with implications for the evolution of feeding in Cryptodire turtles. J. Expl Zool. 281, 280–287. Taylor, G. K., Nudds, R. L. & Thomas, A. L. R. 2003 Flying and swimming animals cruise at a Strouhal number tuned for high power efficiency. Lett. Nature 425, 707–711. Comparison of the vortex structures generated in the wake between the intermittent swimming (τ = 0.4, T = 1.1) and the continuous swimming (τ = 0.4, T = 0.4). Comparison of the vortex structures generated in the wake for the intermittent swimming cases with shorter (τ = 0.4, T = 1.1) and longer (τ = 0.8, T = 0.4) force durations.